Senegal and Spanish Sahara on the Atlantic Coast. It is about three times the size of New Mexico and mostly Saharan desert. The northeast border meets the southwest border of Algeria. It was largely ignored by westerners during the 19th century colonial expansion in Africa. It was not until October 18, 1904, that it became a 'civil territory' dependency of French West Africa. It was not teeming with people nor recognized natural resources. 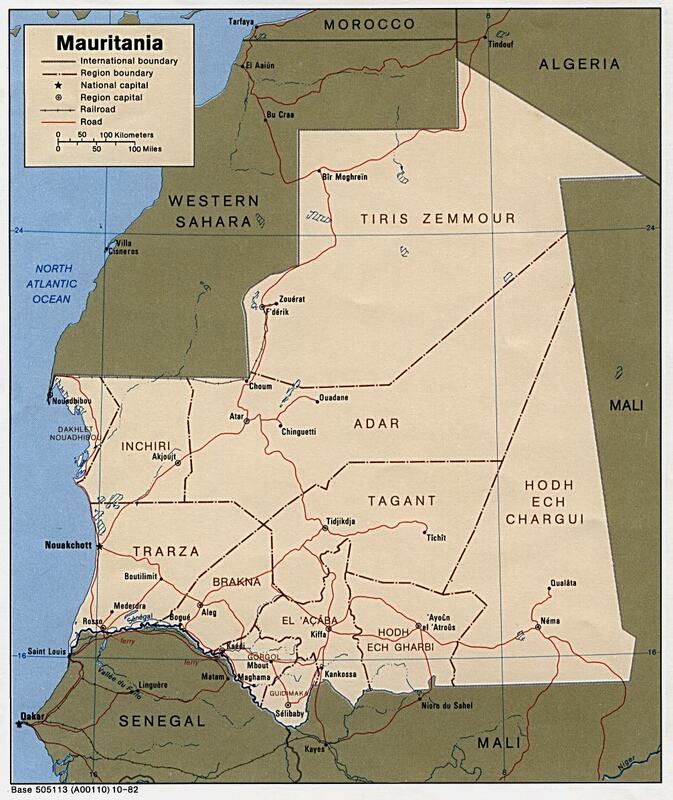 Mauritania received colonial status on January 1, 1921. There were only two post offices in Mauritania before 1906. There were only ten post offices in 1915. 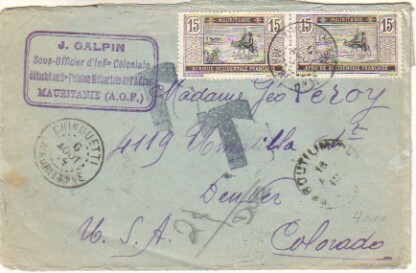 This cover was sent from Chinguetti which is over 400 km inland at 20°27'N and 12°22'W. It was marked with two Chinguetti CDS. The next stop is surprising (at least to me). There is a transit marking for Boutilimit on August 13.
inland about 150 km at 17°33'N and 14°42'W. It appears to be nearly as isolated as Chinguetti. There appears to be no natural access between the two. the mail went from Chinguetti to Boutilimit on a caravan. That may have been the only way out of Chinguetti. Take a look at a map and see just how remote this area appears to be. The sender used a boxed purple handstamp as a return address. 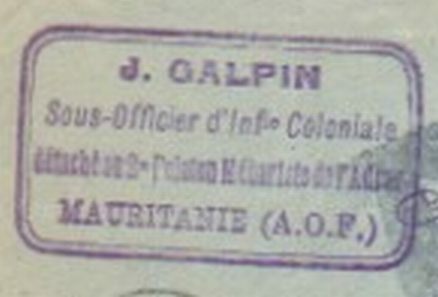 The second line translates as Under-Officer, Colonial Infantry. I believe the third line indicates the unit. Can someone decipher the third line? French Foreign Legion from the Legion's Fort Saganne in Chinguetti. He thinks it may have been sent to a next-of-kin of some soldier. I would also add that it might have been sent to an acquaintance or relative of his. Rocky Mountains, two thirds of the way across the United States. and 2¢ due was collected on delivery in Denver. This certainly has to be one of the most unusual covers incoming to Denver. *David Benson says the bold T handstamps would have normally been applied at the origin. *Thanks to Jim Whitford-Stark for the help on the sender's return address stamp.